Chances are you have some difficult relationships in your life. I know I do. I’m learning that instead of running away from challenging relationships, God wants me to learn from them. 1. We lash out or we shut down. Most of us tend to deviate toward one extreme or another. Regardless, neither response is godly, or will help bring healing to the relationship. 2. We react before we listen. In James 1:19 it says we should be “quick to hear, slow to speak, slow to anger.” Let’s make it our prayer this week to listen first and speak afterwards. 3. We try to win every argument. We don’t have to win every single argument every single time. Let’s determine to give up a few arguments for the sake of love. You’ll be surprised how good it will feel. 4. We forget the main goal. The main goal of every relationship, in case you need to be reminded, is love out of a pure heart. This isn’t about winning or proving we’re right. God wants to use us to be the smell of Christ to those around us. Are we? 5. We expect it to be easy. If it were easy you wouldn’t have read this far. It’s not. But with God all things are possible. We can do all things through Christ who gives us strength. Remember that nothing worthwhile is easy. 6. We make it about us. Hate to be the one to tell you this again, but it’s not about you! It’s about Christ working through us reaching others with His love. Don’t forget that. 7. We try to do it alone. Impossible! We cannot love the difficult people in our life without the Holy Spirit giving us love and self-control. Pray, pray, pray. And get a couple of trusted friends to pray through it with you. 8. We often pray for the wrong thing. Let’s not pray for release but for resolve. Let’s not pray for escape but for endurance. You get the point. 9. We try to change the other person. Our job is not to change the difficult people in our life. Our job is to love them, and see where God would have us change. Let’s stop trying so hard to do what isn’t our job. 10. We give up too soon. Never, never, never give up. God is at work even when we don’t see it! Just think–what if God had given up on us? 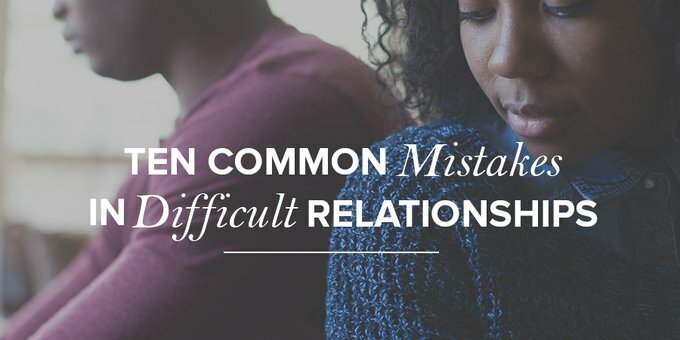 What is your most common mistake in dealing with difficult relationships, and what have you found to help? Lina is a Pediatric Emergency Room Doctor in Chicago and the women’s ministry director at her church, Harvest Bible Chapel, Rolling Meadows Campus. She is the author of Thrive, and blogs at Living With Power where she provides biblical truths for everyday life.